Course Aims: The CPCS A58 course aims to provide the candidate with a thorough practical and theory training in operating a 360 Excavator in order to to enable the candidate to pass the CPCS Theory and Practical Tests. Configure and set for travel. Configure and set – up for excavating duties. 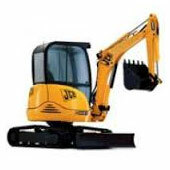 Extract differing types of excavations in various types of ground. Place materials into transporting vehicles and hoppers. Grade, spread and level ground and materials. Lift, move and place a variety of slung loads (Endorsement C). Travel with slung loads*(Endorsement C).